All over the world forests and woodlands are damaged or reset to initial stages by fire, insect outbreaks or storms. In Central Europe storm events are the most important natural disturbances affecting stand structures of both natural and managed forests and yet only a few studies exist on long-term forest development following the destruction of the tree layer by a storm. This paper presents a permanent plot study established in 1988 in the Bavarian Forest National Park (SE Germany) on areas, where the tree layer had been destructed by a storm on August 1, 1983. The records concerning (1) floristic composition (spermatophytes, pteridophytes, bryophytes, lichens) and cover degree, (2) location and shape of each tree higher than 1 meter (height, diameter at breast height) including position of fallen trees and (3) number of seedlings and saplings were taken in 1988, 1993 and 1998. Two windfall areas, situated next to each other in the same broad and flat valley bottom on wet soils under local cold climate conditions (potential as well as recent vegetation:Calamagrostio villosae-Piceetum bazzanietosum) were analyzed, one of them with completely free development after the storm event (“untouched”), the other with dead wood cleared off after the event, but thereafter with free development (“cleared”). 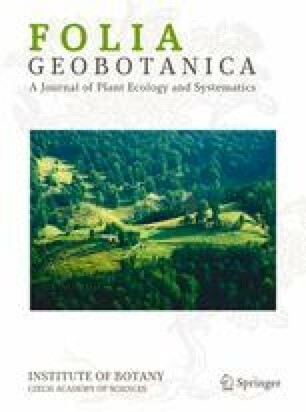 The vegetation analysis separated two major trends in vegetation dynamics: (1) On the cleared plots with intensive soil-surface disturbance (removal of the damaged wood) the species composition changed towards pioneer herb vegetation (Rubus sp. ), and pioneer forest species (here: birch,Betula pendula and/orB. pubescens) established. Subsequently, vegetation dynamics leading towards clusters of forest ground-layer species composition took place. (2) In untouched stands, where soil-surface disturbances were restricted to pit-and-mound-system created by uprooted trees, the patchiness of forest vegetation increased and a regeneration of mainly terminal tree species (here: Norway spruce,Picea abies) started. Stand development for the next 100 years was simulated using the model FORSKA-M. The model is individual-based and includes competition for light, soil water, and nutrients. The simulations suggest that floristic structures of cleared and untouched plots, respectively, will remain different for several decades, but within one century, the floristic structure becomes rather similar. Major processes in forest ecosystems which can be used to improve forest management and nature conservation practices have been identified based on the results of the case study.